This juried exhibition presents sixty-five recent paintings by sixty-four artists residing in Alaska, California, Colorado, Idaho, New Mexico, Oregon, and Washington. View all Entries & Winners. The word palimpsest is defined as something reused or altered but still bearing visible traces of its earlier form. In their artworks, both artists explore the concept of traces of the past or other objects visible within the compositions of their works. 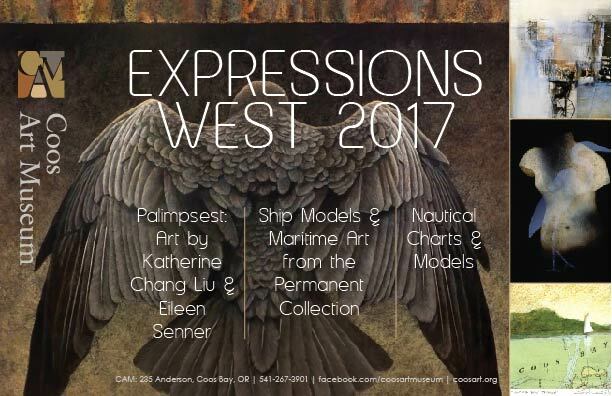 Both Senner and Chang Liu are residents of southern California and Chang Liu is the juror of the Expressions West exhibition. Katherine Chang-Liu and Eileen Senner will be presenting a free public discussion about Expressions and Palimpsest on Saturday April 15 at 1pm. Two exhibitions combine to celebrate Coos Bay’s Festival of Sail, June 1 through 4. Included are two-dimensional art works from the Museum’s Permanent Collection and model ships on loan for the exhibition. Most of the models were constructed by the late Paul Carter of Madras, Oregon. Provided by Coos Bay’s Boat Building Center, the display features nautical charts and half-ship models.